Questions? Call us at 1-954-781-4714 – http://cinziamazzamakeup.com/?x=comprare-levitra-Abruzzo We’re Here To Serve You! viagra generico 50 mg pagamento online Bring http://cinziamazzamakeup.com/?x=omprare-viagra-generico-50-mg-consegna-rapida-a-Firenze out the grime and bring http://cinziamazzamakeup.com/?x=vardenafil-originale-consegna-veloce on the shine with waterless car wash and wax from IBIZ®. IBIZ® Waterless Wash and Wax source site is safe for all finishes and surfaces including: clear coat, lacquer, enamel, powder coat, metallic, antique & freshly painted vehicles. Pamper your show car with the best waterless car wash in the business and give your paint a deep natural shine. Classic Car? Don’t worry! 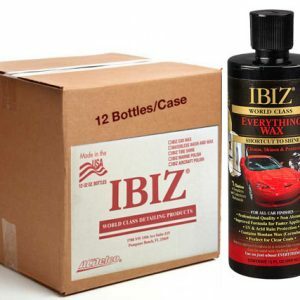 IBIZ® products are held to the highest standards by car clubs across the country. We are officially endorsed by car enthusiast clubs, professional racers, and antique car museums across the country. These include: the Corvette Club of America, Ferrari Race Team, Porsche Race Team, Antique Automobile Club of America Museum, Natmus Museum, Posies Rods and Custom and many more! We understand the relationship you have with your vehicle and know that you’re probably using another waterless wash and wax – and wouldn’t want to compromise the integrity of your collection. But trust us when we say that, time and time again, we’ve presented IBIZ® wash and wax products at car shows across the country and we’ve made believers out of the most die-hard skeptics. IBIZ® Waterless Wash and Wax has been on QVC for 7 years with record sales on the #1 home shopping network in the nation. Our products are safe for all finishes, and provide a mirror finish shine, removing dirt, dust, bugs, and particles from worn out areas, and restoring them back to life. 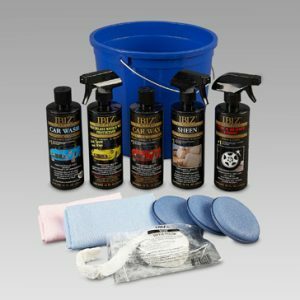 In many cases it is not necessary to wash before using IBIZ® Waterless Wash & Wax; if there is no mud, sand or dirt on your vehicle. 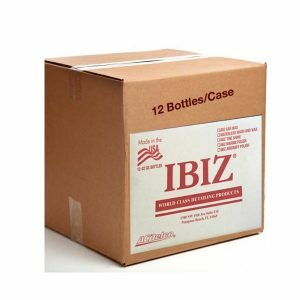 With other products, you have to pre-treat the area, but with IBIZ® you merely need to apply it on. Here’s how! Shake the bottle enough so that the product is mixed properly and releases in a white color. Set the spray nozzle to the finest spray setting, and make 2 or 3 practice squirts to help you get an idea of what you’re working with. Simply hold the container about 1 to 2 feet away from the area you want to treat while squeezing the dispensing trigger. Work the product in the area with a damp, clean, cotton or microfiber cloth. Use a front to back motion to help the product sink into the pores of the paint. Then take another dry clean cloth in a front to back motion to wipe the area dry. Turn the cloth from time to time until dry. Spray on, wipe off and repeat moving around the vehicle. If you are working too hard to remove the product it means you are using too much. Less waterless wash and wax product is better; no need to generously apply. 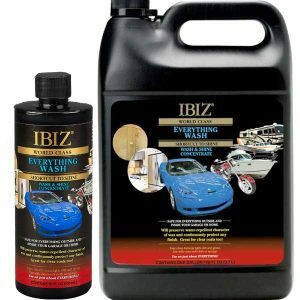 For show cars or cars that are in pristine condition, you can cut IBIZ® Best Waterless Wash & Wax 90% with water by emitting 10% into a separate container. Refill the bottle with water. Shake. It will be ready to use at a fraction of the cost! Let us know how you use IBIZ® on your surface or vehicle. We want to know your story!